About Hotel: BRAND NEW. 4-Floors, 140-Rooms, Interior Corridors, High-Speed Internet, Complimentary on-site parking, Pets allowed (fee), Air conditioning, Alarm clock, Coffee maker/tea service, Crib, Individual climate control, Iron and ironing board, Sofa bed, Hair dryer, Separate tub and shower, Color Cable/satellite TV, Dishwasher, Microwave oven, Pots, pans, serving dishes, Refrigerator with ice maker, Silverware, Stove, Table and chairs, Toaster oven, Buffet breakfast, Evening reception, Exercise Room, Outdoor Pool, Phone with Voice-mail. Railroad View: What should be an excellent view is likely a narrow fair view at best thanks to a concrete wall along the railroad. You need on a high floor overlooking the pool to be able to see the open area between the motel property and the East Belknap Street bridge that spans over the railroad. This area is likely the only chance of viewing the passing trains. Location/ Directions: Interstate 30 to downtown Fort Worth. Exit E. Lancaster Avenue. Turn right on Commerce Street. The hotel is located immediately on the right of Commerce Street. Wireless High Speed Internet Access in All Guest Rooms (Complimentary), Gift Shop, Self and Valet Parking, 24-Hour Business Center, Luggage Storage, Vending Machine, Laundry/Valet Service, Ice Machine, 24-Hour Concierge Service, Elevators, 24-Hour Fitness Facility, Spa, Indoor Heated Pool, Sauna, In-Room Massage Treatments, Spa Services. Railroad View: Excellent View! Any room on the train station side of the building will offer a railroad view. Higher floor rooms will be best. There is a single story building between the hotel and the train station that restrict the railroad view from ground level and 1st/2nd floors. Railroads past Hotel: Union Pacific / BNSF Railway / Amtrak / Trinity Railway Express. Notes: This hotel is near the popular Tower 55, a local train watching spot in Fort Worth. Photo Comment: Three of the four railroad that travel past the hotel can be seen in this picture taken from the I-35 exit ramp. The rear DPU locomotive of a northbound Union Pacific empty hopper train can be seen passing a southbound BNSF loaded coal train. Amtrak can also be seen in the background represented by a single Genesis locomotive and a Superliner passenger car. 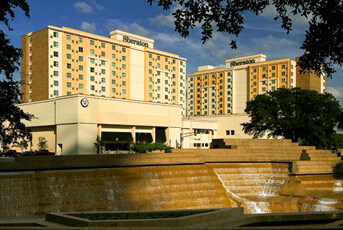 The Sheraton Hotel is circled in yellow. 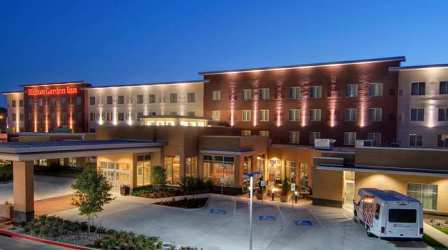 Walking Distance to Fort Worth Union Station, Fort Worth, TX. Location/ Directions: Interstate 30. Exit University (Exit 12), proceed South. Hotel is on the left behind the Macaroni Grill. About Hotel: 4-Floors, 79-Rooms, Interior Corridors, Free high-speed Internet, Free breakfast, Fitness center, Pets not allowed, Air conditioning, Alarm clock, Crib, Individual climate control, Iron and ironing board, Mini fridge in some rooms, Pull-out sofa bed, Roll-away bed, Hair dryer, Color Cable/satellite TV with HBO, Microwave oven, Phone with voice mail, Coffee/tea in-room, Fitness Center, Indoor Pool, Whirlpool. Railroad View: Excellent View! You need a high floor room (3rd & 4th floors) on the front of the motel to have a railroad view. The railroad is located across West Rosedale Street which is an elevated roadway, the railroad is elevated as well. Even numbered rooms face the railroad, you can hear train horns of approaching trains. Railroads past Hotel: Union Pacific Railroad. 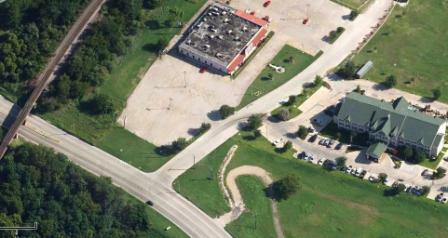 This motel is located just outside the east end of Union Pacific's large Fort Worth Yard and locomotive shop. 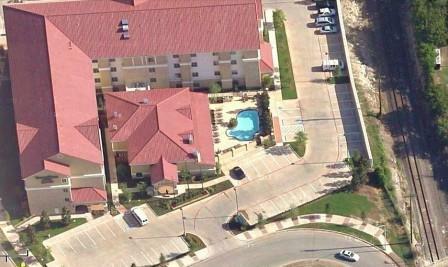 Photo Comment: The aerial photo shows the Fairfield Inn to the right, and the Union Pacific Railroad to the left. Both the railroad and the main road next to the railroad are elevated. This makes a need for a 3rd or 4th floor room on the front of the motel needed for a railroad view. Location/ Directions: I-35W, Exit # 53. About Hotel: 4-Floors, 157-Rooms, Interior Corridors, High-Speed Internet, Outdoor Pool, Fitness Center, Suites, Pets Allowed, 32" LCD Cable TV, Alarm clock/radio, Coffee maker with complimentary coffee, Dresser and closet, Hair dryer, Iron/ironing board, Free Local telephone calls, Microwave, Refrigerator, Voice mail, Free Wi-Fi access, Wing back chair, Work desk. Railroad View: Fair View from rooms on the front of the motel. Rooms do not face the railroad directly. Ask for a 2nd, 3rd or 4th floor room on the front of the building. Railroad will be off to the right. Trains pass over East Northside Drive on a bridge. This is the area where you should see the trains. Trees limit the rest of the railroad view. Railroads past Hotel: Union Pacific (Former Missouri Pacific / MKT / Texas & Pacific). The motel is just south of CP T752. Photo Comment: Country Inn is the building with the green roof. Location/ Directions: From I35 South or North: 1. Start by going on I35 towards Fort Worth. 2. Merge onto I-30 W via EXIT 51A toward Abilene 2.4 miles 3. Take the Forest Park Blvd exit, EXIT 12. Take Left on Forest Park BLVD, destination on the Left. From I30 East or West: 1. Start by going on I30 towards Fort Worth. 2. Take the Forest Park Blvd exit, EXIT 12B. Take Left on Forest Park BLVD, destination on the Left. About Hotel: BRAND NEW. 4-Floors, 157-Rooms, Interior Corridors, Business Center, Cribs, High chairs, 24-hour Pavilion Pantry Market, Coin Laundry, Elevators, Local Area Transportation, Lounge, Room Service, Fitness Room, Pool, Free WI-Fi, Free parking, No Pets Allowed, 100% Non-smoking Facility, Air Conditioning, Arm Chair with Ottoman, Black-Out Curtains, Clock Radio w/ MP3 Connection, Ergonomic Mirra Desk Chair, 42 Inch Flat Panel HD TV, Thermostat (adjustable), Coffee Maker, Evening Room Service Available, Hairdryer, Free High Speed Internet, Iron/Ironing Board, Microwave, Mini Refrigerator, Newspaper M-F (USA Today), Self Laundry Available. Two-Line Phone with voicemail. Railroad View: This is a brand new hotel, and we do not know how the building sits. The site is cornered by the busy UP / Amtrak (former T&P) Line, and the Fort Worth and Western Railroad. There is a chance of a good view of the Union Pacific line since its elevated past the hotel. Prior to building the hotel, there was a lot of trees along the FWWR line. Railroads past Hotel: The site of the hotel is cornered by two rail lines, a UP line on the north side and a FWWR line to the east side of the property. East-West Line (located on north side of hotel) = Union Pacific / Amtrak (on the former Texas & Pacific line). North-South Line = Fort Worth & Western Railroad (on the former Frisco line). The UP line crosses over the FWWR line near the hotel at the railroad location of CP T247.